SANTA CLARITA, Calif., September 20, 2017/ 3BL Media/ - Princess Cruises presented its first donation from the Princess Animal Welfare Sponsor (PAWS) to the Alaska Wildlife Conservation Center (AWCC) in the amount of $25,000. 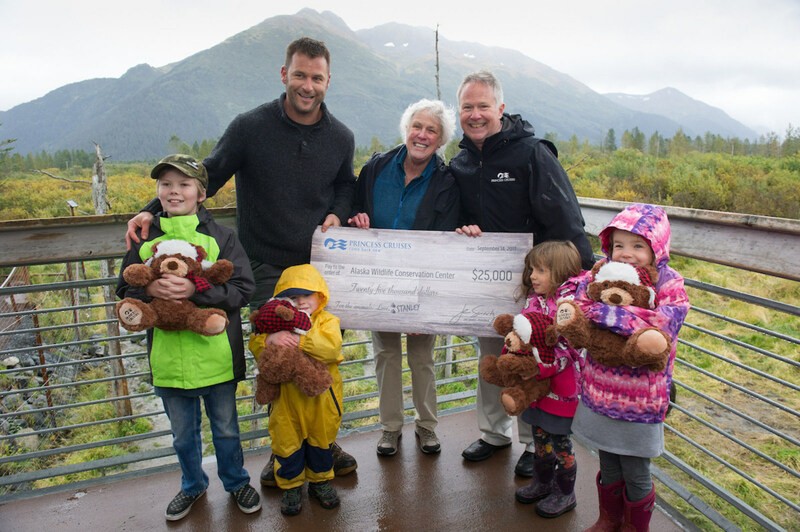 PAWS was established by Princess Cruises to donate a portion of proceeds from the sales of Stanley the Bear, the cruise line's recently introduced plush bear, to local causes and charities that support nature, animals and wildlife. "Our support of the Alaska Wildlife Conservation Center furthers our commitment to nature and wildlife in the places we visit, as well as offers a much-desired authentic Alaska experience to our guests," said Ralph Samuels, vice president of public affairs, Princess Cruises. The AWCC plans to use the donation to fund an enhanced bear viewing and sitting areas on the property and a new family interactive space. In addition, the AWCC will be providing Princess Cruises bear related items, such as bear paw prints to be used in the cruise line's Camp Discovery youth centers. "We're honored to be the first recipient of $25,000 from the Princess Animal Welfare Sponsor and applaud the cruise line for supporting our sanctuary, dedicated to preserving Alaska's wildlife through conservation, research, education and quality animal care," said Karen Cowart, AWCC board member. For nearly 50 years, Princess Cruises has been recognized as the destination leader in Alaska and has been named "Best Cruise Line in Alaska" 10 consecutive years by Travel Weekly magazine. On board, Alaska guests experience the award-winning program, North to Alaska, which includes unique Alaska onboard enrichment , entertainment and food and beverage offerings, as well as Discovery Channel and Animal Planet recommended and exclusive shore excursions, as part of the cruise line's Discovery at Sea partnership. More information can be found at www.princess.com/alaska<http://www.princess.com/alaska>. Founded in 1993 in Portage, Alaska, the Alaska Wildlife and Conservation Center has provided care and refuge for hundreds of displaced animals. Visitors to the center can view baby animals, bison, black and brown bears, deer, eagles, elk, foxes and more. Guests make critical contributions in the form of admission fees, donations, memberships and gift shop purchases. Open daily March – October and on weekends November - February. More information can be found at www.alaskawildlife.org<http://www.alaskawildlife.org/>. One of the best-known names in cruising, Princess Cruises is a global cruise line and tour company operating a fleet of 17 modern cruise ships renowned for their innovative design and wide array of choices in dining, entertainment and amenities, all provided with the experience of exceptional customer service. A recognized leader in worldwide cruising, Princess carries two million guests each year to more than 360 destinations around the globe on more than 150 itineraries ranging in length from three to 111 days. The company is part of Carnival Corporation & plc (NYSE/LSE: CCL; NYSE:CUK).